My thoughts also turn to those who have fought for this country in other remote parts of the world. I recall, during a trip to Europe twenty years ago, visiting the American Military Cemetery just south of Florence, Italy. The photo at the top of this page is of that location. This place - 70 acres of sacred soil - is the location of graves of 4402 dead American soldiers, airman and sailors who lost their lives fighting in Italy in 1944. As you walk through the grounds and view the monuments and grave markers you cannot help but be moved by the sacrifice those men gave in defense of their country. I still get choked up just thinking about my experience there. This burial ground is one of 24 such places located on foreign soil that are managed by the American Battle Monuments Commission, established in 1923. You can read more about this commission and the battle monuments here. 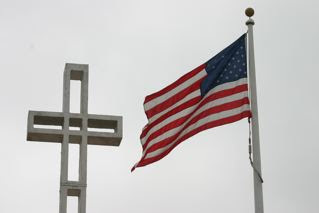 The image to the right is of the cross and flag at Mt. 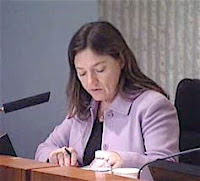 Soledad, in San Diego. At the base of the cross are plaques with names and accomplishments of men and women who served our country. I recommend a day trip down to see this wonderful monument, which is viewed by hundreds of thousands of people each day as they commute to and from work. As you celebrate this holiday in whatever way you feel is appropriate, I hope you'll take a moment to reflect on it's real purpose. California Assemblyman and former Orange County Supervisor Jim Silva has posted a very relevant entry on the Red County/OC Blog entitled "Freedom Isn't Free". I hope you'll click on that link and read his message on this very special holiday. Whether you agree with the current conflicts in the Middle East or not, please remember the men and women who volunteered to serve on our behalf. As you watch the race cars circle the track at Indianapolis I hope you'll think of the brave men and women who have made the ultimate sacrifice for us. As you picnic in a park, incinerating hot dogs and hamburgers, please remember those who serve us in distant places. Our freedom and liberty were won with the sacrifice of young lives. Please take a moment to recall their sacrifice and that of their families so we all can enjoy our lives today. Remember the flag and cross and all they represent. This afternoon my email notification from the City of Costa Mesa told me that on the agenda of the next city council meeting on June 5th there will be an item regarding EMINENT DOMAIN. Well, those two words always get my attention and the notification was vague, so I made a couple of calls to the city for clarification. I eventually received a call from City Attorney Kim Barlow, who wanted to let me know the item in question was merely some mandatory housekeeping. It involves an ordinance that affirms that the Redevelopment Agency (the City Council in a fancy dress) no longer has the authority to impose eminent domain on the original downtown redevelopment area. So, my heart rate slowed a little and my blood pressure dropped back down to normal. I'm satisfied with her reply and was grateful for the quick response to my question. As an aside, it's my observation from way, way outside that this contract with Barlow's firm to provide City Attorney services seems to be working very well. Not only does Barlow and her team seem to be ready with answers put to them on the dais, they also appear to be quite pro-active in anticipating potential problem areas and taking steps to head them off. Although the shift from an in-house counsel was quite controversial at the time, this move seems to have been the right one. The immigration bill pending before Congress seems to have re-invigorated Your Neighbor (The-Brain-Who-Ate-Costa-Mesa) over at the CM Press. His last three posts here, here and here, are aimed directly at the bill. In his post this morning he advocates flooding senators with anti-immigrant telephone calls to stop the process. However, of even greater interest is his most recent essay published on the New Nation website today entitled, "It's More Than Amnesty; It's Genocide For European-Americans", in which he attempts to convince us that he's not really a racist - he's only a simple guy, worried about the dilution of the Aryan gene pool. I want to thank him for this one, because it provides focus on what his real motives are as he goes from forum to forum bleating about rogue soccer players, slums and such. This essay helps you understand the foundation of all his activities in Costa Mesa over more than a decade. It also helps you understand how he has been so influential over a few easily-led residents, including our young jailer/mayor. Under the guise of protecting the sanctity of the Aryan gene pool he has methodically gone about facilitating the discomfort of the Latinos among us - legal and illegal - and orchestrating their expulsion from our city by attacking them where they live, where they work, where their children are educated and, yes, even where they kick a soccer ball around after work. Your Neighbor says he's not a racist. Well, Dictionary.com provides the following definition for the word racism: "a belief or doctrine that inherent differences among the various human races determine cultural or individual achievement, usually involving the idea that one's own race is superior and has the right to rule others." Read his essay, linked above, and you decide - is he or isn't he a racist? To me, he personifies the word. The raging debate about illegal immigration has this country in a turmoil. I doubt you will find many American citizens who think illegal immigration is a good idea - I certainly don't. The issue is complex - if it were simple, those simpletons in Congress would have solved it long ago. In my view, any solution must start with secure borders. Unless that is the first step anything else that might be done is futile, costly and ineffective. How we manage the tens of millions of illegal aliens currently working in this country is a separate issue. From a purely practical standing, I just don't see how you deport 12 to 30 million illegal aliens without having a devastating impact on our economy. Howeve r, Your Neighbor is fanning the flames of this illegal immigrant hysteria to further his own, perverted goal - protecting the integrity of the Aryan gene pool. What astounds me is that so many people actually buy into his putrid philosophy and follow his lead. Like some kind of twisted Pied Piper, he has mesmerized his followers into ignoring his ultimate goal - the expulsion of Latinos - by providing them with chunks of raw meat (slums, soccer players, low test scores) to chew on as they march to his tune. This man has, virtually single-handedly, dragged Costa Mesa to the point of no return. Through his oratory and influence he has created a culture of intolerance within our city and, through it, turned Costa Mesa into the poster child for anti-immigrant hate. It deeply saddens me that more than a few folks in this city have been swept up in his scheme and seem to be chanting his mantra like a group of brain-dead zombies. Hopefully, in the near future they will awaken and realize what has been happening to them and step back from this man and renounce his view of the world.